General Vyacheslav Ivanovich Trubnikov was Director of Foreign Intelligence Service for Russia between 1996 and 2000. In 2000, he was appointed First Deputy Minister of Foreign Affairs and Special Representative (with the rank of Federal Minister) of the President of the Russian Federation in CIS. 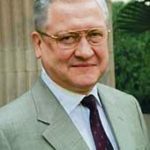 From 2004 to 2009 he served as Extraordinary and Plenipotentiary Ambassador of the Russian Federation in the Republic of India. He is a member of the Russian Academy of Natural Sciences, International Institute for Strategic Studies in the United Kingdom and of the Russian Union of Journalists.